Wyman’s Teen Outreach Program® (TOP®) promotes the positive development of adolescents through curriculum-guided, interactive group discussions; positive adult guidance and support; and community service learning. TOP is delivered by trained adult facilitators across a school year to groups of teens (called “TOP Clubs”). TOP is designed to meet the developmental needs of middle and high school teens and can be implemented in a variety of settings, including in-school, after-school, through community-based organizations or in systems and institutional settings, including residential facilities. TOP curriculum is focused on key topics related to adolescent health and development, including building social, emotional, and life skills; developing a positive sense of self; and connecting with others. Equal opportunities are not a reality for all young people. Right now, there are more than 13.5 million young people across our country living in poverty and communities of stress. Their potential, and therefore our potential as a nation, will remain untapped if we don’t invest in them today. Educational Success Fact: Less than 70 percent of students from low-income backgrounds graduate from 16 states across the nation. In those states, researchers estimate that nearly 191,000 students did not graduate on time with a diploma. Healthy Behaviors and Relationships Fact: Birth rates for non-Hispanic black and Hispanic teens are two times higher than their white counterparts. Life and Leadership Skills Fact: Only one-third of American youth can identify an area of interest, passion or talent. Those who are able to identify their interests rarely know how to develop their passions, and 20 percent report being discouraged from pursuing passions. Research shows that teens who have participated in TOP experience more positive outcomes than their peers. These teens are ready to become the next generation of leaders. Join Us. Invest in them by becoming a partner. Today. Empower Teens: Strong, quality programs ensure teens have the tools and skills needed to succeed. Equip Adults: Caring, responsive and knowledgeable adults build relationships with youth by creating engaging and empowering learning environments. Strengthen Systems: Well-researched systems-solutions create equitable and transformative opportunities for teens. The content is divided into three books: “Building my Skills,” “Learning about Myself” and “Connecting with Others” to empower teens to build a foundation of healthy behaviors, life skills and a sense of purpose. Each book includes lessons that support the developmental levels of teens from 6th to 12th grade: Foundational-level lessons, Intermediate-Level and Advanced. The curriculum also includes an accompanying Facilitators Guide. As one of Wyman’s most successful, scalable and evidenced based programs, TOP helps teens acquire the skills needed for positive outcomes and successful transitions into adulthood. Wyman recognized the potential impact in replicating TOP on a national scale and committed to building a National Network of partners and providers who could deliver the program – and potentially other evidence-based practices – with fidelity to teens nationwide. To realize this vision, Wyman employs a comprehensive relationship-based replication partnership approach. When organizations partner with Wyman to replicate TOP in their own communities, they experience intensive program training and start-up support, periodic program reviews and audits, access to a proprietary data collection and monitoring system, and on-going technical assistance by Wyman staff to ensure each partner is experiencing a high-quality implementation of the program. In partnering with Wyman, organization become a member of a National Network of organizations delivering TOP—a community of practice through which they may interact with peers who are also committed to delivering excellence. In July of 2009, Wyman’s National Network launched, beginning partnerships with a variety of organizations with the need, desire, and capability to reach teens with effective programming. In 2018, the National Network reaches nearly 25,000 teens in 32 states and Washington D.C.
Our fidelity with flexibility model helps our partners adapt TOP to a variety of environments while achieving impressive outcomes. The Partner creates and uses a written Quality Assurance Plan (QAP), which is updated annually. Ensure clubs are guided by facilitators who have completed TOP training. Maintain a ratio of at least one TOP facilitator per 25 teens (1:25). Many facilitators prefer a ratio of 1:10, 1:15 or 2:25. TOP Clubs are planned to include weekly peer group meetings throughout the program cycle. Club Program Cycle should be no less than 32 weeks. 100% of Clubs deliver a minimum of 25 meetings during a club program cycle. TOP Clubs are planned to include sufficient support and opportunities for teens to achieve the required 20 hours of Community Service Learning. 75% of teens who have completed TOP complete at least 20 hours of CSL during the club program cycle. TOP Clubs are planned to include at least 12 lessons from the TOP Curriculum. TOP can be adapted to fit the unique needs of special populations, like youth in foster care, and settings, such as residential facilities. Prior discussion and approval with Wyman is required. To take the next step, contact us. Our Research & Learning Team reviews and approves TOP adaptation applications based on several factors, including whether they are responsive to young people’s needs, and likely to maximize outcomes for young people. Wyman employs a comprehensive replication partnership framed in an implementation science approach that advances the TOP through effective training, monitoring, evaluation and coaching for quality program implementation. Wyman’s intensive “Train the Trainer” model teaches partners how to deliver the Teen Outreach Program with fidelity. 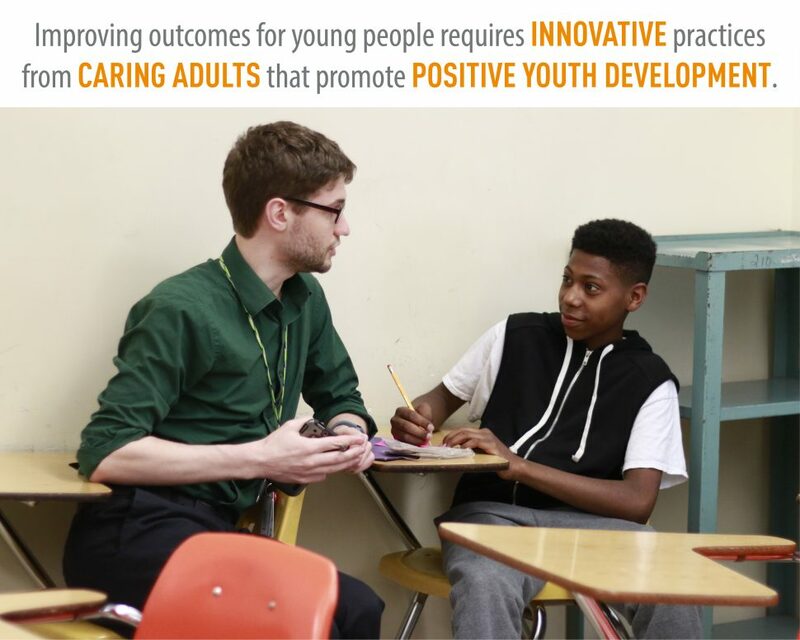 It supports partner’s ability to develop deeper skills in training staff, monitoring and coaching for quality, and in overall strategies and approaches to delivering a high-quality, holistic Positive Youth Development (PYD) program. Annual Facilitator Institutes and Coordinator Learning Exchange opportunities deepen partners’ expertise and practice. Monthly e-newsletters share programmatic updates, tips, funding opportunities and partner spotlights. The TOP Curriculum focuses on three core content areas that work together as protective factors, reducing the impact of risk and promoting positive youth development: skill building with book Building My Skills, developing a sense of self with book Learning About Myself, and making connections with book Connecting with Others. The proprietary data collection system, Wyman Connect, enables partners with the ability to easily monitor program progress, to generate instant reports that should be used for program evaluation and quality monitoring, grant writing, and other related purposes. Teen Pre and Post-Surveys, as well as access to reports to measure program impact. Wyman’s National Network Team provides expert support and technical assistance via phone calls and webinars throughout the year, as well as audits and feedback of the program in-action if requested. Annual program reviews help partners identify and address issues quickly, and ensure continuous quality improvement at the point of program delivery. Replication partners are able to connect directly to Wyman representatives, and benefit by receiving updates to curriculum, share lessons learned and program delivery tips, access information on funding sources and other resources, and download a library of useful materials to support implementation. National Network partners are part of a community of practice through which they may interact with peers who are committed to delivering excellence. As a result, they learn from their participation in the National Network and are able to develop workable solutions to issues and challenges through their interaction with their peers across the country. Recognizing that all nonprofit and community organizations are different in the size and scope of youth they are able to serve, Wyman offers a tiered partnership program. Please contact Tori Gale to learn more about which replication partnership would best benefit your teens. Visit our Resources Page to view sample curriculum, the logic model and obtain other downloadable content. Stay updated on the latest news, trends and success stories via our Blog Page.